If you are visiting our website from outside the U.S., please be aware that your information may be transferred to, stored in, and processed in the U.S. (where our and our suppliers’ servers and databases are located and operated). The privacy and data protection laws and regulations of the U.S. may not be as comprehensive as those in the country from where you are accessing our website. As a benefit to our partners, we share the contact information of our partners with our other partners, for example, through a member directory, master convention calendar, or mailing list. We do not sell, rent or loan any of your personally identifiable information to any unaffiliated third party. In addition, we may collect, use and share aggregated information that does not uniquely identify you, which enables us to improve and enrich our services and website content. GMCVB may use and share your information if GMCVB believes it is necessary to operate this website or where disclosure may be required by law, or to protect GMCVB&apos;s rights or the rights of others. GMCVB may collect data pertaining to you and the equipment, software, and communication methods you use to access the Internet and our website, including Internet Protocol (“IP”) addresses assigned to the computers and other devices from where you access the Internet, your Internet service provider (ISP), your device ID number, your approximate geographic location, your browser type, the pages you access on our website, the websites you access before and after Visiting our website, the length of time you spend on our website, date and time stamps, and clickstream data. We may use this information to administer our website and its servers, to generate statistical information, to monitor and analyze website traffic and usage patterns, to monitor and prevent fraud, to investigate complaints and violations of our policies, and to improve our website’s content and the products, services, materials, and other content that we describe or make available through our website. We may combine this information with personally identifiable information, other collected information, and information obtained from third parties. The suppliers we use to provide our website may collect information about your Visits to our website and other websites. Most web browsers automatically accept cookies, but you can disable this function. Please be aware that disabling cookies may impact your use and enjoyment of this website. The website may incorporate content, including feeds scripts embedded in the website’s code as well as visible content (for example, videos), provided by third parties. In some cases, those third parties may collect data about how you interact with their content. The website uses third-party analytics tools (e.g., Google Analytics, provided by Google Inc.) to collect and process data about your use of the website, including when you Visit the website, URLs of the websites that you Visit prior to Visiting the website and when you Visit those websites, and IP addresses assigned to the devices from where you access the Internet. Our analytics providers may set and read cookies to collect this data and your web browser will automatically send data collected by those cookies to our analytics providers. If you are a member of Facebook but do not wish Facebook to collect data relating to you via the website, we suggest that you hide social media platform plug-ins using an ad blocker or always log off completely from the social media platform before Visiting other websites and delete all related cookies. If you do not want Google to collect and use this information you may Visit the Google Ad Settings page: https://www.google.com/safetycenter/tools/#manage-your-ads-preferences. Changing your Google ad settings will not in any way affect your ability to use our website. To opt out of remarketing advertising provided through Google, to customize your ad preferences, or to limit Google’s collection or use this information, Visit Google’s Safety Center and Google’s Ad Settings and follow Google’s personalized ad opt-out instructions. Opting out will not affect your use of the Site. We may share information we collect with our website management and hosting suppliers, marketing and public relations service providers, email service suppliers, and other contractors, vendors and suppliers to provide the website and our products and services to you and as may otherwise be permitted by applicable law. We require our suppliers to comply with all applicable data privacy laws and regulations and they are authorized to use your personally identifiable information solely as necessary to provide the applicable services to GMCVB. GMCVB may use your personal information to send you promotional communications. You have the opportunity to opt-out of receiving promotional communications from us at any time. To discontinue your receipt of promotional communications, simply click on the “unsubscribe” link in the body of the email. This website has security measures in place to help protect against the loss, misuse and alteration of the information under our control. While we cannot guarantee that loss, misuse or alteration to data will not occur, GMCVB uses industry-standard technology, such as Secure Socket Layers (“SSL”), to help safeguard against loss, misuse or alteration of data. In certain areas, the information passed between your browser and our system is encrypted with SSL technology to create a protected connection between you and our website to ensure confidentiality. If a breach into our security systems occurs, GMCVB will notify you to the extent required under applicable law. 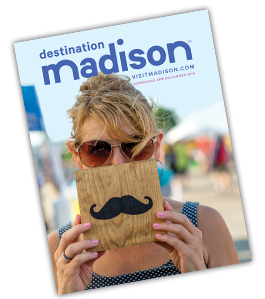 If you wish to have access to your personal information in our records, please contact us with your request at privacy@visitmadison.com. You may also request that we update your personal information or correct any factual errors that you believe may exist regarding this information. This website may link to, or be linked to, other websites not maintained by or related to GMCVB. GMCVB is not responsible for the privacy policies or practices of any third parties or third-party websites, including any linked or linking websites. To the extent that you disclose personally identifiable information to any third parties, different rules may apply to their use and disclosure of personal information that you disclose to them. We encourage you to review the privacy policies of all other websites before disclosing your personal information to them. This website is not directed toward children under 13 years of age and GMCVB does not knowingly collect or use information from children under 13 through this website.